What does it mean when a whisky has an age on it? Does older automatically mean better? The great unwashed may think so, but it’s all about knowing what you want out of a good dram. For years the rack of spirits have sat there staring us in the eye, daring us to question what seems like an open and shut case about what age means. At feet level, you’ll generally find your whisky with no age on it, or at the very least a proud “Three Year” emblazoned across it. If you’re ever desperate enough to give these bottom shelfers a go, you’ll find it already tastes like someone went and melted a handful of ice in it. Scanning your eyes upwards, you start getting to some fairly reasonable offerings and stuff you probably have with your regular friends. The 12 year scotch is about here and you reckon that it’s probably gone unconsumed long enough. Craning your head upwards, you start to feel the judgement of the gods bearing down upon you. This top shelf whisky is older than you, and your grandfather probably harvested the wheat that was used to make it while dodging messerschmitts. The taste seems to get better and the price goes up. You’re no Sherlock Holmes but this all appears to make sense. Age is directly correlated with taste and value. Or is it? Let’s start with the basics. The age of the whisky refers to the time spent in oak barrels, not the time in the bottle, since whisky won’t change a lot once bottled. The variations in flavour come largely from the barrel aging process. The barrels are usually ex-sherry, bourbon, port or wine barrels so other flavours come through from these as well as from the oak itself. The longer in the barrel, the more prominent these flavours become. The age on your bottle of a blended scotch is the age of the youngest whisky used to create it. That means when you’re trying the likes of Johnnie Walker’s blended Scotch, you at least have a bead on the youngest whisky in the bottle. If the bottle has no age on it, then it’s what’s known as a no age statement (NAS) whisky. However, you can be guaranteed it’s at least 3 years old, unless you’re dealing with your father-in-laws bathtub brew. Don’t go forgetting about a bottle of 2 year old whisky for three years and then go passing it off as a 5 year to your friends. Unlike wine which continues to age in the bottle, whisky doesn’t change after it’s bottled. NAS whisky isn’t necessarily a bad thing at all. As whisky has become more popular, the reserves made twenty or so years ago have more strain put on them. Glenmorangie and Ardbeg have been doing stunning NAS whiskies, and connoisseurs will find something to love in this range. For most people however, there is a sweet spot. In blind tastings we did, we found generally hitting a whisky around the 18 year mark is going to give you the best experience. After this point, ageing in the barrel draws out the tannins in the oak, so the longer in the barrel, the more woody flavours you start to get. As a result, the whisky begins to taste more grainy or woody as the tannins start to dominate. While some whisky connoisseurs may prefer this, we found the 18 to 20 year old single malts to be the most favoured. But don’t let this turn you off trying a 50 year, far from it. Experiment and be willing to explore! Variety is the spice of life. Spending that long in a barrel will give it a complex taste that is well worth the experience. But remember to pay for the quality, not the age. In next months issue of M2, we will be dipping into some 40 to 50 year old vintages that will change your life and are absolutely worth it. For now though we’ll be looking at a range between 12 and 21 years. This richly sherried single malt is matured for at least 12 years in a combination of fine Spanish Pedro Ximenez and Oloroso sherry casks. 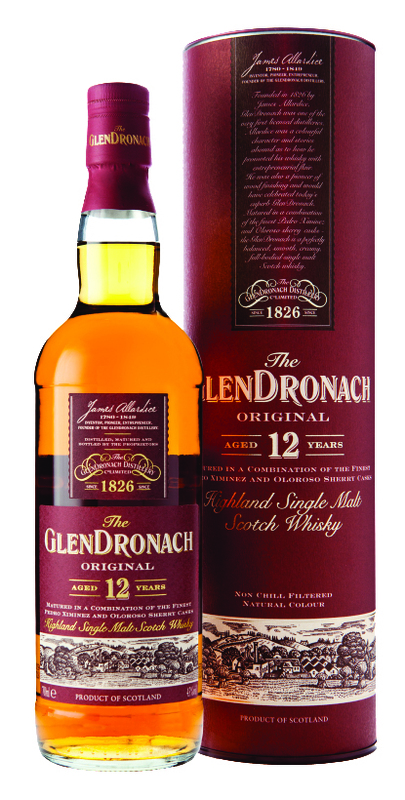 Non-chill filtered, of natural colour and bottled at 43%, the GlenDronach 12 Year Old Original is a sweet, creamy dram. On the nose, it will hit you with hints of ginger, spiced mulled wine and pear. On the palette, be prepared for a silk-smooth experience from the rich oak and sherry sweetness imparted from the casks. Over the course of 18 years Master Distiller, Alan Winchester, takes this expression through a combination of cask types, including both first and second-fill American oak (for tropical fruitiness) and ex-sherry oak (for spicy complexity). The result is a single malt that is complex, yet elegant and balanced. 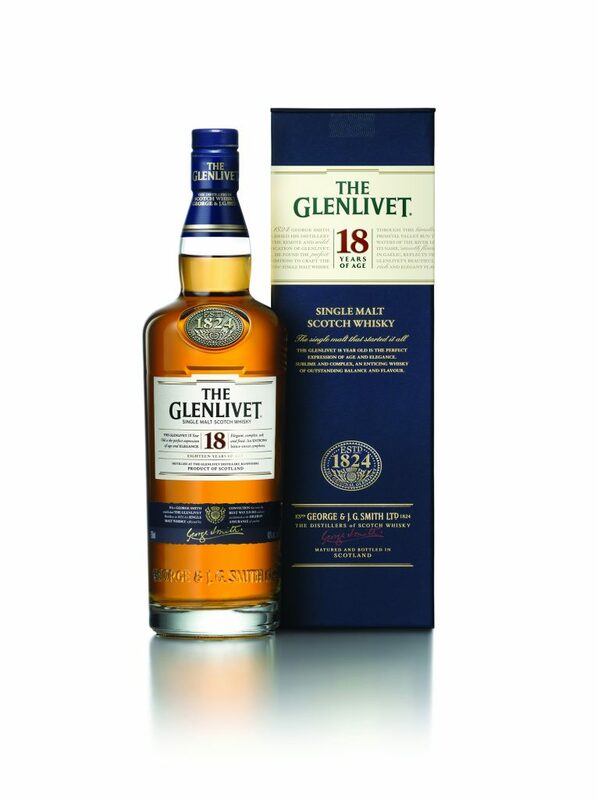 The 18 Year Old has won more awards than any other expression; every bottle is a true example of the quality and taste of The Glenlivet. It is, after all, crafted to impress. 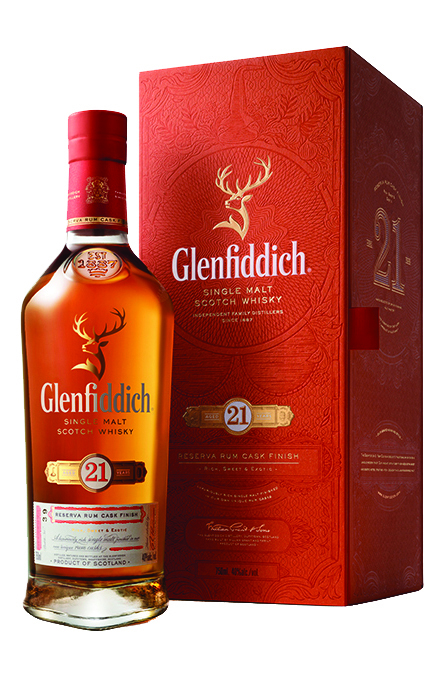 Patiently matured for 21 years on-site at the distillery, it is an exquisite, traditional Speyside whisky, rich and ripe with all the Glenfiddich signature notes. However, a twist comes later in life when this single malt is finished in first fill bourbon barrels that once contained rum from the Caribbean. This gives the whisky a spicy warmth, indulgent vanilla and toffee sweetness.